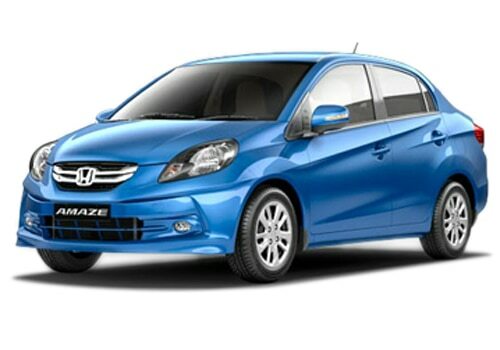 The all new Honda Amaze is now at just Rs. 4.99 lakh! This is certainly going to make waves across the markets and there is no doubt, it will give tough times to other compact sedans in the segment. Reports coming in from the markets that the car has received tremendous response like no other car has received till date. According to the reports, the new Amaze compact sedan car has achieved over 6000 initial bookings, which explains about the vehicle's demand in the auto markets. Many of the experts in the auto financing circuit are expecting that the bookings might go up to 10,000 to 11,000 in about two to three days, which will be a major milestone for the car. Launched in about 10 variants, Honda Amaze price starts at Rs. 4.99 lakh and goes up to Rs. 7.60 lakh (ex showroom price, New Delhi). People who are looking to buy this compact sedan can choose in between petrol and diesel engine options. On the other side, people who are choosing petrol variants, can also choose in between 5 speed manual and 5 speed automatic transmission gearbox option. However, there is no automatic gearbox available for the diesel Honda Amaze. This new vehicle from the fleet of Honda Cars looks pretty decent with rich finishing at both inside and out while it offers good amount of space for the occupants. Despite being the less expensive vehicle, it doesn't look cheap at all, which will be an added advantage to the car. Although, the Honda Amaze features are not the most attractive but they look to be very decent with air conditioner, power steering, power windows, cup holders, music player anti lock braking system and few others. It also got dual air bags, driver seat height adjustment, body colored OVRMs with integrated blinkers, 400 liters bootspace capacity, rear chrome garnish and front chrome grille. As said earlier, the new Amaze looks very design from both inside and out. If you just take a close look at the Honda Amaze pictures, you will be able to find that the front fascia is mostly identical to the Brio Hatch. Except design of the front grille, everything is quite similar to the Brio hatch. The design of the radiator grille is very rich where there is a lot of chrome is being used that indeed enhancing the look of the vehicle. However, the rear part looks something that is identical to the Honda City sedan. The overall look of the car is very impressive with great finishing. This vehicle will now lock horns with the Swift Dzire in the compact sedan segment. Affording money on this car will be a great idea.